About 6,300 Lexus LS 500/500h cars may have tires with sidewalls that can crack. 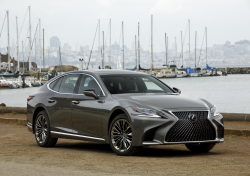 March 2, 2019 — A Lexus LS 500/500h recall will have dealerships replacing all four tires if they are run-flat tires made by a specific company. Lexus says about 6,300 model year 2018 Lexus LS 500/500h cars have run-flat tires that weren't attached to the wheels properly. Cracks can appear on the sidewall reinforcement layers and cause the tread to separate while driving. The National Highway Traffic Safety Administration hasn't released information about the recall, but Lexus says recall notices will be mailed at the end of April 2019. All four tires will be replaced if even one tire is a run-flat manufactured by a specific company, but Lexus didn't name the company. If you drive a 2018 Lexus LS 500 or 500h equipped with run-flat tires and have concerns about tread separations, please call 800-255-3987. CarComplaints.com has complaints about numerous Lexus models.